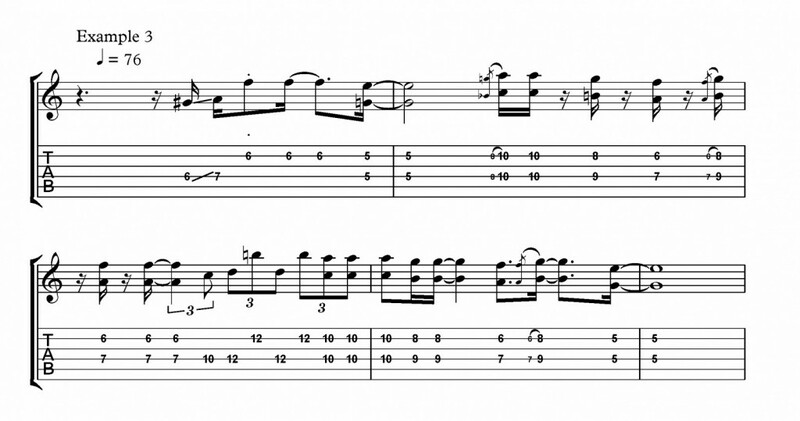 As a quick departure from technique focus, this week we will be exploring the use of ‘pop sixths’ on guitar. While preparing a requested song for a gig recently I was transcribing a guitar part from the recording that featured sixth intervals and thought it would be worth investigating to add to your palette of ideas when creating pop guitar parts. A sixth is an interval between two notes in a scale six steps apart, for example C up to A. There are two types of sixth, a major and a minor one. The step of the scale on which you start from dictates which of these will be diatonic (in the key). The sequence in the major scale is major, major, minor, major, major, minor, minor. Note how the fingerings change in example one to accommodate for this. When practicing sixths a new key, your ear will quickly tell you when you’ve gone wrong if you get confused with the pattern. You may have experimented with playing thirds simultaneously on guitar, or in harmony split between two guitarists. This can give a great blended sound but an advantage of employing sixths is that the melody note is still the highest note, and the harmony which would have been a third above is now a sixth below, providing interest and thickness without masking the melody to the listener. First off I have written out the C major scale in harmonised sixths. Notice that I am focusing on the top note of each double stop and think of the bottom note as the harmony. Therefore, we start on C in the top note. This is because harmonising a sixth above a melody note may not be consonant with the chord underneath, but a sixth below (the same as a third above will sound right, even when it’s not part of the chord). Now let’s apply a picking pattern to these ideas to give them context. Many rock and indie songs by bands such as Snow Patrol and The Killers make use of these chiming riffs as accompaniment to verse or bridge sections of their songs. Aim to let the two notes ring into each other, and use a some slight overdrive to give it a little bit of bite. Finally we feature some sliding sixths in a slightly country style. These ideas blur the boundary between rhythm and lead playing and make great ‘response phrases’ between vocal phrasing in a song. I used hybrid picking here. Strumming through with the pick would be fine too, but a nice feature of hybrid picking means both notes are played simultaneously, like a piano player would play it. In a pop context, The Killers, Snow Patrol and Richard Hawley have employed this, along with innumerable others. In a country double stop style, look to Brent Mason and Danny Gatton. Eric Johnson has also employed sixths in his playing and compositions too.